Current weather reports are indicating that we may be on the verge of our first major winter storm this year. The snow is set to begin falling tomorrow with total accumulations estimated at 2″-4″ in the greater Chicago area. This is only the beginning as the weather reports further indicate that the biggest round of snowfall is to begin Tuesday afternoon and continue into Wednesday. This second round of snow is the actual winter storm we are being warned of. Conditions are expected to deteriorate rapidly across the northern Illinois area with snowfall and strong winds bringing on near white-out conditions. The total snow accumulation during the major portion of the winter storm is expected to fall somewhere in the 8″-12″ range. If that is the case, driving conditions will be very poor and slow-going throughout the Chicagoland area. Do not drive unless it is absolutely necessary. 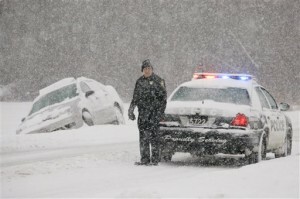 If you must drive, stick to major roads as those are usually the first to be plowed. It is always a wise idea to keep an extra shovel, some melting salt, jumper-cables, gloves, hats, and blankets stored in your trunk. You may even want to keep some extra snacks and a couple bottles of water. Having these items with you will be very beneficial should you get stuck in the snow or have a long commute because of the weather. Be sure you have plenty of gasoline; fill your gas tank. Your drive may take an extra-long time or in the event you get stuck in the snow and have to wait for assistance, you will be far more comfortable. No gas = no heat. Be sure your cellular phone is fully charged and functioning prior to traveling during a winter storm. Should you need to call for help, you will be happy you did. You may even want to have an additional cellular phone battery on hand. Be sure you have plenty of food and water on hand prior to the storm. You may not be able to get through the snow to run out to the grocery store. You should also have plenty of your necessary medications on hand. Be sure your furnace is fully functioning. If you have a fireplace, be sure you have a good stockpile of firewood; a fireplace is a nice secondary heating option should you need it. If you are able, shovel the snow from your driveways and walkways frequently. It is much easier to remove 1″-2″ of snow five times than 5″-10″ of snow once. Have a plan of care in place for the elderly. You may want to have an elderly loved one stay with you until the threat of the snow storm has passed. If you can afford a backup generator, they could be beneficial should snow or ice knock down any power-lines in the area. Be sure to only operate a generator in an open-air location (not in your closed garage) as the fumes from the engine contain carbon monoxide and could be deadly. Know how to find out about local school and business closings. Here is where you can find local winter storm school closing information. Be smart and prepared and you will get through any winter storm with little or no inconvenience. as someone who drives for a living and takes driving seriously can I just say that I am hoping that in future snowstorms (and yes, there will be be more) more people just stay home. everyone gets mad at all the hype before a storm hits but did anyone actually listen? seems no. the roads were way too crowded the day the storm hit. sorry for the rant. but it’s still pretty scary out there.